I’m finally starting to get in a spring-y mood. I’m ready for a little color. I’ve been seeing this gorgeous blue-green color everywhere and I am craving it. I did a faux patina champagne bucket in a similar color and I love it. Some of these trendy pottery pieces can be really expensive though, and I’d rather not pay for something I can easily make. It can be kind of pricey, so I decided to do some of my own. Remember my embarrassing pot addiction, and how I vowed to fix them up? 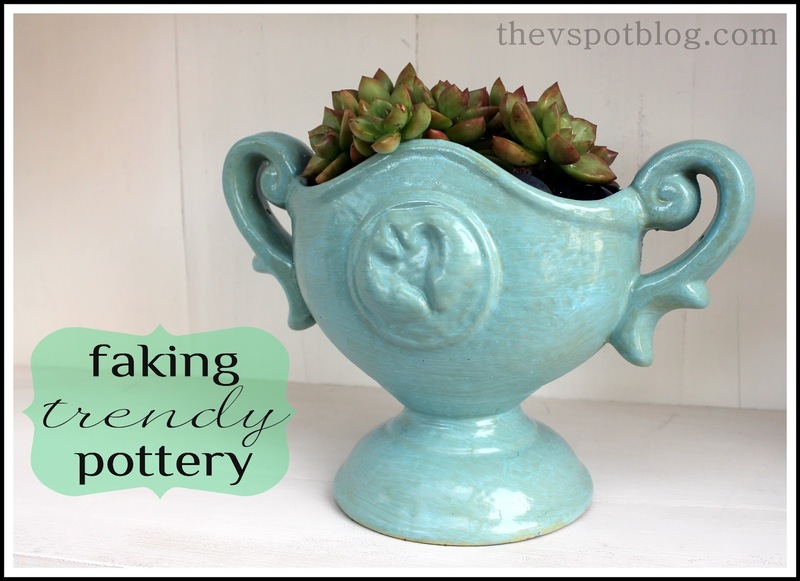 I started out with an urn that I had previously spray painted yellow, but was now chipped. I didn’t even bother to sand it, I just sprayed it a sage green. When that was dry, I put a small amount of light blue paint directly onto the urn and sort of dry-brushed/slapped the paint on until the whole thing was covered. It sounds funny to say “slapped the paint on” yet that is exactly what I mean. You move the brush fairly quickly back and forth, and the paint rubs off in some places more than others, so you have a bit of depth in the colors. 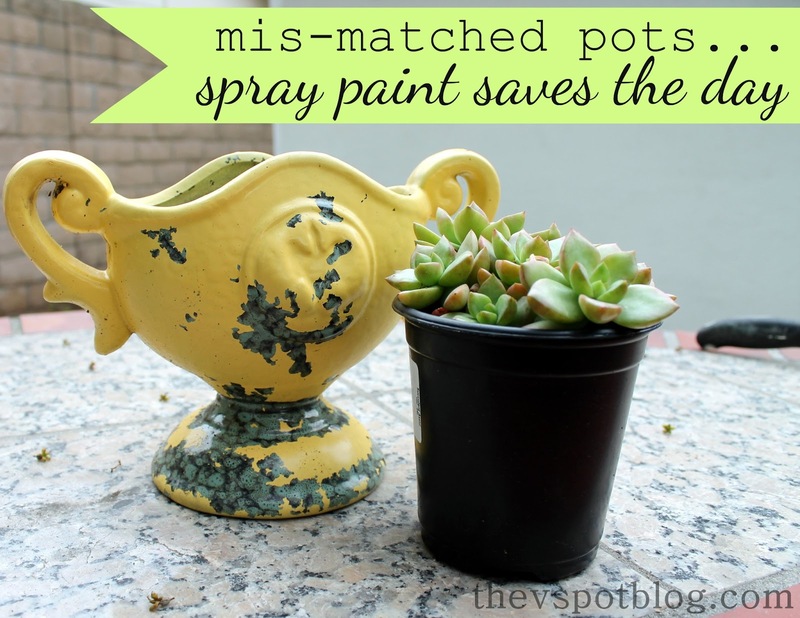 Once the paint is dry, spray it with a nice coat of a clear gloss, let it dry and pop a plant in there. My friend and I went shopping yesterday and I was seeing pots and urns like this for $40 and up. (A big one was $395!) No thanks. I like my version that recycled something I already had and probably cost about $3 to make. (I said that in my head like the Partridge family song I think I love you) Why? I have no idea. It’s late, I’ll use that excuse. Love the color you achieved it’s very pretty. The new vase looks tres expensive now! The shape was super cute to start with but the new color is gorge!! I love it! I’m going to be checking yard sales for some old beat up pots that I can upcycle! Thanks for the inspiration! This is great, however Im morr interested in the assistant position, kinda tricky since I’m stuck here in NW PA. However Id still like to be considered for that job! Love, love this! What exact color spray paint did you use and what kind of clear gloss? I love how you were able to get a glazed look! 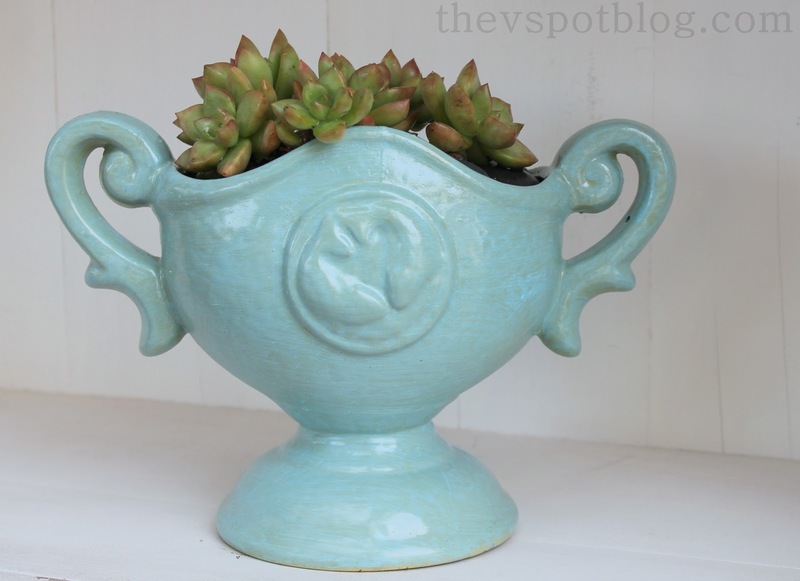 I have so many pots that I would love to update with this idea. Thanks so much for sharing girl!! Now I need to gather up some pots and urns and get busy! That’s a lovely celadon effect. I wonder what a crackle finish would look like over the top? Love this Viv–I always love to freshen up old stuff! 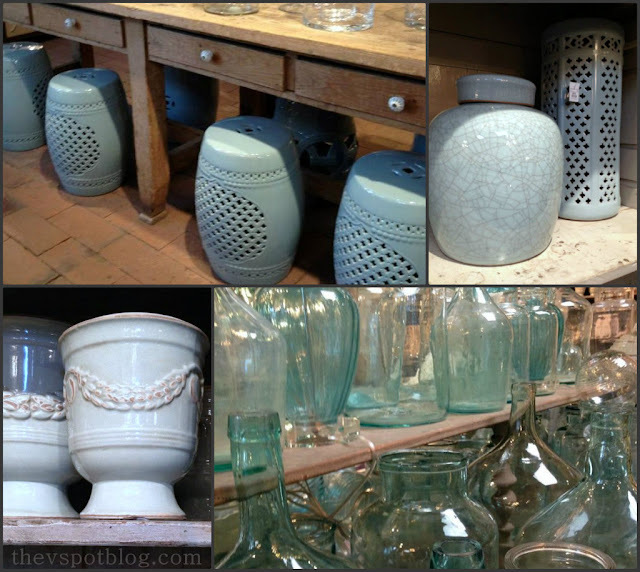 vases and pots. Thanks tons.